My first tentative pedal pushes came back in January 2013. I’ve learnt from that experience that if you get the wrong bike, one that doesn’t quite fit, then as a new cyclist you will learn to loathe your bike and it’ll be left to gather dust or rust. Like that toasted sandwich maker. Since collecting that first bike a nineteen months ago my determination to cycle around London has dwindled. When I moved house and I wasn’t sure the bike would fit in the removal van I mumbled that I could leave it behind if needed, it was the drivers determination that saw it come along to Haggerston from Willesden Green. I’ve picked up the odd Boris bike to cycle small distances. I took the plunge to buy a new bike a couple of weeks back and I now resent walking anywhere. Here’s what I’ve found over the past fortnight. Having a bike frame that fits obviously makes all the difference. Having a local bike shop near me is even better. Though Better Health Bikes aren’t open yet I had the pleasure of meeting Colin when I had problems adjusting my seat. And as it turns out setting the handlebars correctly, fitting my helmet … it goes on. Keep your eye out for their grand opening by following them on Twitter. 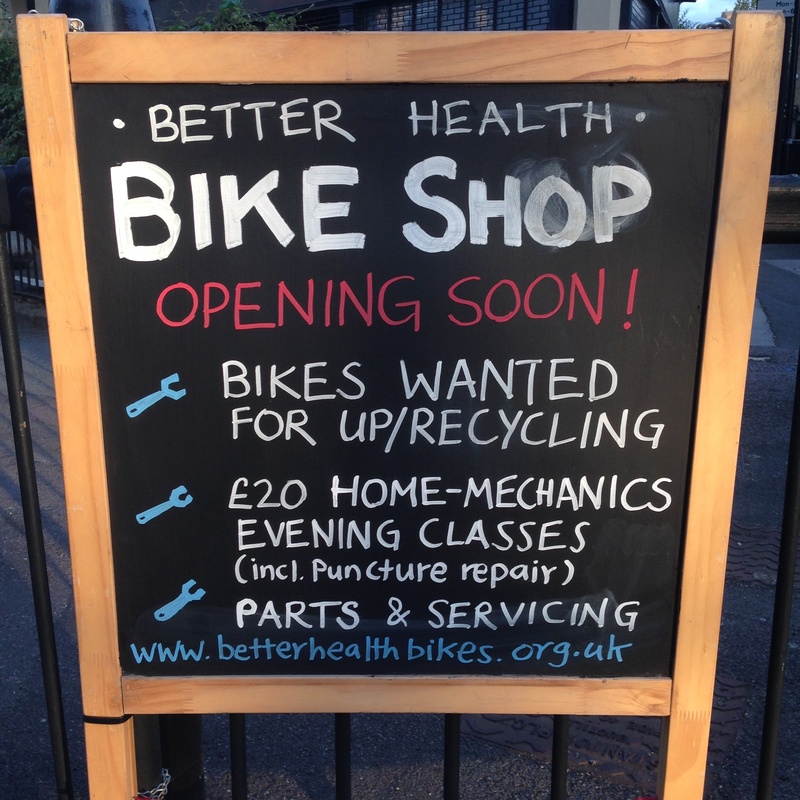 The bike shop is also a social enterprise so you’ll get your bike looked at and support a social enterprise supporting mental ill-health. And if you’re feeling particularly Parisian and have a basket on your bike you can pop next door to their bakery for la baguette. It was Colin who stated that “you either go for Victoria Pendleton or Mary Poppins when choosing a bike. You’ve gone for Poppins.” He is spot on. Perhaps this time next year I’ll be Pendleton, but for now Colin is right (I opted for an upright style bike). Then there was the fantastic team behind Pru Ride London. 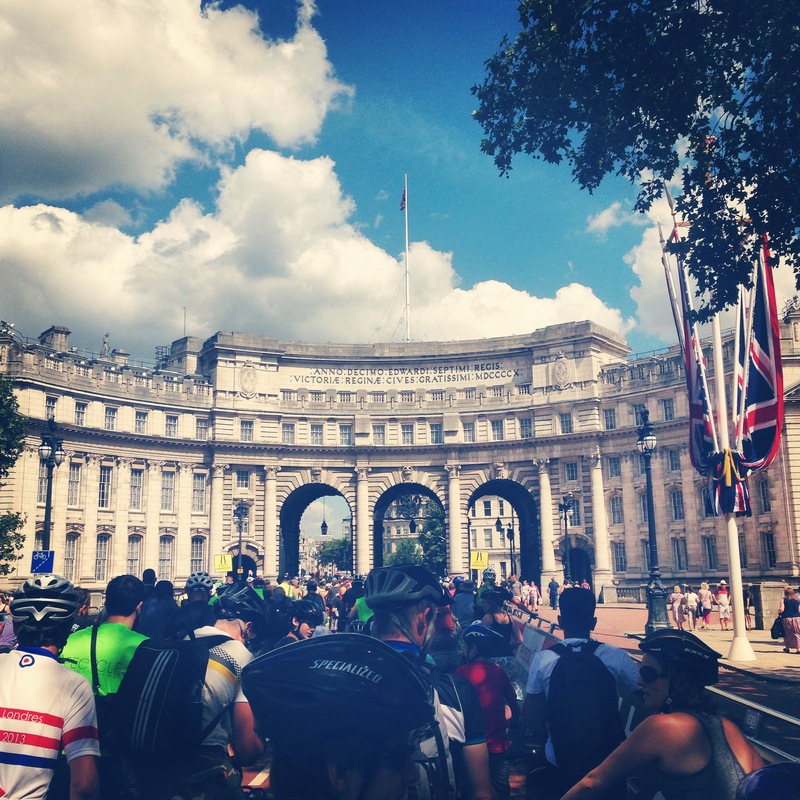 The confidence I gained cycling around London on my own, not only on the car free route but the journey I made to get to the start line and back was invaluable. From the steady realisation that actually I am not learning to cycle, that I do. To the giddy excitement I felt riding through Blackfriars underpass with a group of strangers who cheered as I shouted “I’m in the peloton.” Nothing could wipe the smile from my face that day, not even as I lay in the bath with the sorest of bums through forgetting my padded shorts as I dashed out that morning. And finally, the London roads. That great fear I’ve had, my own personal imaginings of that final scene from One Day (the film version being set just down the road). I am aware I could be blogging in a weeks time completely retracting what I’m just about to type but I’m setting it down as it is now. Aside from one Royal Mail van who decided to drive so far up my padded bum (I remember every day now) that letters were spewing out of my mouth, I have found white van drivers, flash convertibles, our double-decker buses, rattly old motors courteous and conscientious. As long as I’ve been cycling sensibly and showing awareness they have as well. It’s sad to say fellow cyclists, especially around Shoreditch, running red lights have caused me a degree of stress on the roads. But even more than that it’s pedestrians running out into the road suddenly to cross, on the green light at crossings or scattered up and down roads. Even people with prams who appear dashing across from behind parked vans, or buses waiting at stops, that really have caused me the most anger, frustration and worry since I’ve been cycling pretty much daily. I truly don’t believe people would take these risks if it was a car so close to them and I’ve tried to reason with why they do so with bikes. The only thing I can think of is in a car you don’t necessarily see the person behind the wheel, you know you’re not harder than cars. On a bike perhaps you appear more human as you’re seen clearly, a lot of people even make direct eye contact as they jump out suddenly, their facial expression saying “sorry, but you’ll stop or swerve suddenly right?”. I know my blog isn’t going to change much about that, but if you read this and are guilty of this behaviour stop and think for your own sake, and if selfish motivation doesn’t help you see reason think of others. 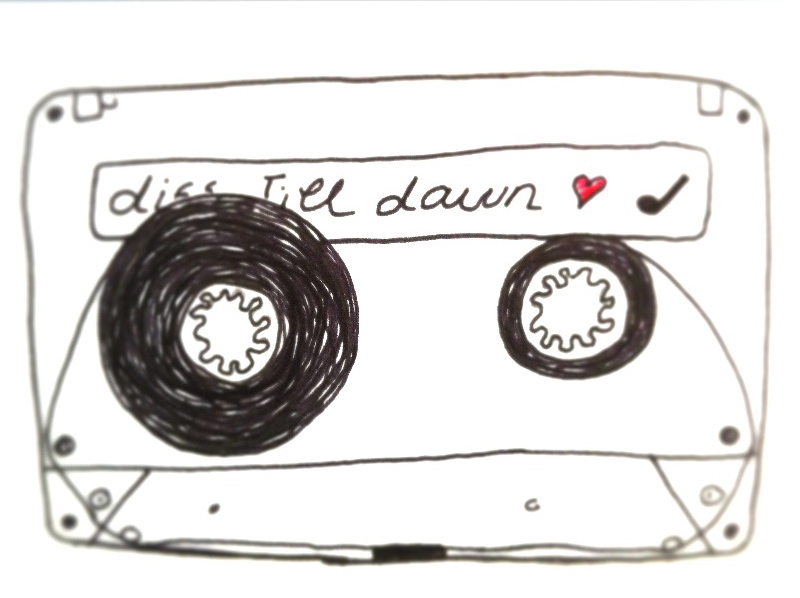 I haven’t blogged in over a year. There was no conscious decision to stop, no one moment where I became bored or lacked the words. In fact there’s been many a time I’ve been frustrated to the limitations of Twitter to get a point across I feel passionate about. I don’t know if this post will be it for another year or until next week. But tonight, as I start to type this on Sunday 3rd August I almost have too many things to say. That recently I had to take a very long and critical look at myself in the mirror and face up to weight gained, health not quite up to scratch (some of you will be familiar with my blogs on suffering from Tinnitus, add to that a pesky and painful foot injury I’ve not been able to shake this year). I’ve always stated exercise is the hardest routine to get into and the easiest to fall out of. But I’ve recently made it to the gym after bad work days when the devil on my shoulder has been telling me to go for pizza and a bottle of wine. Jumped in the pool when I want to be lying in a park finishing my book. Chopping up a rainbow of lettuce, beetroot, tomatoes instead of boiling the kettle to put the pasta in. Showing myself Tough Love. That during Glasgow’s Commonwealth Games I’ve thought back to the lows I went through during 2012 which culminated in the high of The Olympics. Those days, I still confidently state, were my happiest in a decade of living in London, and will remain the most inspirational until the day I die. I think it changed me, for the better. 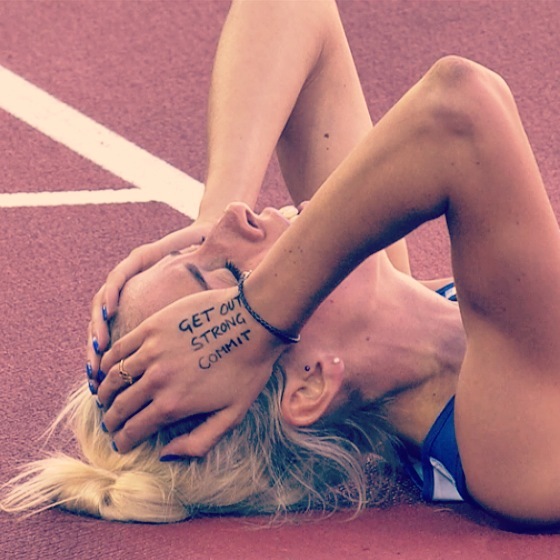 This past week, watching amazing athletes like Lynsey Sharp set such a positive role model for young girls everywhere has been a complete joy. I type this waiting for the inevitable montage to round-up the games so I can cry the just as inevitable sports tears. That today I went to Shuffle Festival’s Day of the Dead, set in the beautifully calm and serene Tower Hamlets Cemetery (my Dad and I can’t be the only ones who find cemeteries peaceful instead of eerie)? I sat listening to a crowd of old east-enders relay their tales of what can be best described under the title of “back in the day”. Complaining about all these retro shops in Brick Lane, thinking fondly on the colourful Sari shops of their youth. How when one of them moved to Somerset the first thing he had to do was learn how to say good morning to people, “do that in the east end people would class you as a loony”. How all these kids are moving to Hackney now because they can’t afford Islington anymore (I had to bite my lip, I wanted to tell them we can’t afford Hackney either). It was like listening to my parents and their friends talk, and because of that, behind my sunglasses I cried happy tears. I sat there until the old nana in her wheelchair finally piped up and said “I wanna go ‘ome”. So this has been a bit of a montage post I guess. To say look after your health, find inspiration in the people and acts that move you, and to cherish your family. Life is fleeting. I’ll sign off with the words of one of those lovely east-enders that made me smile so much today. Last cockney to leave turn off the lights.